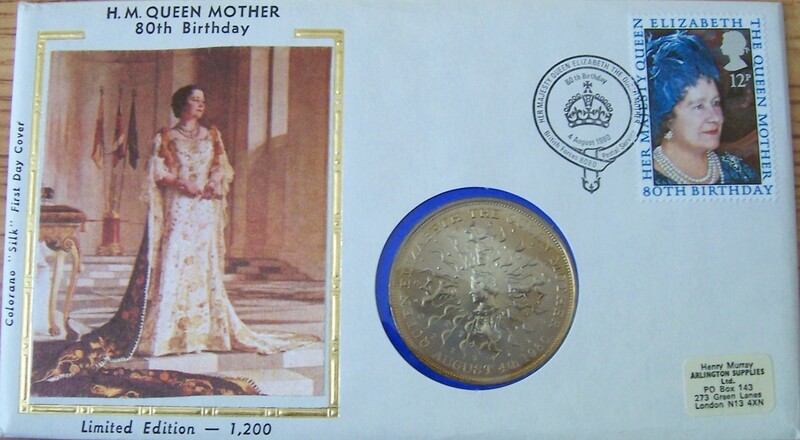 1980 United Kingdom 12 pence stamp commemorating the 80th Birthday of the Queen Mother (Elizabeth Bowes-Lyon, mother of Queen Elizabeth II) Colorano Silk cachet First Day Cover with an uncirculated One Crown coin marking the same event. 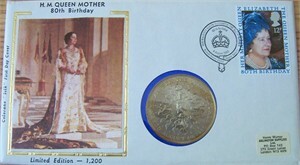 The postmark date of August 4, 1980 was THE SAME EXACT RELEASE DAY for the stamp and coin. Limited edition 1,200. ONLY ONE AVAILABLE FOR SALE.